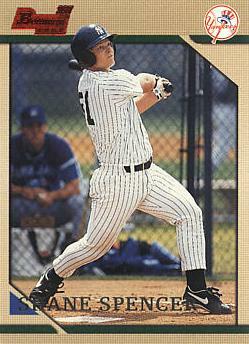 Shane Spencer had been in the Yankees’ farm system for over eight years when he got a call up to the parent club in September of 1998. He had played in the entire atlas of Yankee minor league towns during those previous eight seasons and the closest he had come to making the big league team was when he crossed the picket lines during the 1994 MLB player strike to attend New York’s replacement player spring training camp. Neither the Yankee front office or Yankee fans were hoping for help from promising prospects when September of ’98 rolled around. That team didn’t need any. It was, without a doubt, the best Yankee team I have ever seen play during the fifty years I’ve been a fan. There were absolutely no holes to fill in their lineup, their bench or their pitching staff. Which is why what Shane Spencer was able to do that September was pretty special. The only reason Spencer was getting a shot was the fact that he had put together consecutive 30-home run seasons in the minors. If you’re a position player who wants to get noticed in the Yankee farm system, especially when the parent club is winning pennants, consecutive 30-homer seasons is about the only way to do it. Spencer had actually been called up from and returned to Columbus three times during the 1998 season but the fourth time proved to be the charm. That happened on August 31st. Four days later, Joe Torre rested Bernie Williams, started Chad Curtis in center and inserted his rookie in left. In his first appearance against White Sox southpaw Mike Sirotka, Spencer homered to left field. Five games later, his real streak began, when Torre sent him in to replace Paul O’Neill in right field in the sixth inning of a game against Baltimore. He came up in the top of the ninth with the bases loaded and hit his first Major League grand slam. He would hit seven more home home runs that month including two more grand salami’s and provide Yankee fans with one more great Yankee memory in a season that was full of them. Spencer continued his hot hitting in the playoffs against the Rangers in that year’s ALDS, homering two more times. He finally cooled off in that year’s ALCS which resulted in him seeing very little action in the World Series against the Padres. Spencer played a total of five seasons as a Yankee before getting released after the 2002 season and signing with the Indians. He played well enough during those years to become the team’s regular fourth outfielder but could never break into the starting lineup. He also participated in one of the most memorable plays in Yankee history. It happened in the seventh inning of Game 3 in the Yankee’s 2001 ALDS series against Oakland. The Yankees were ahead 1-0 when with two outs and Jeremy Giambi on first, the A’s Terrence Long hit a ground ball down the right field line past Tino Martinez. Spencer was playing right field and he cut off the ball before it hit the wall but his throw sailed over the heads of two cutoff men and started rolling toward the Yankee on deck circle as Giambi rounded third on his way to scoring the tying run. That’s when Derek Jeter appeared out of nowhere to pick up the ball, and flip it to Jorge Posada who made an incredible sweeping tag that just nipped Giambi.